A female sturgeon's roe supply may constitute as much as 25% of her total body weight. Considering that mature sturgeons can weigh 300 pounds, each one can provide a substantial amount of caviar over a lifetime. In recent years, however, a combination of natural and man-made problems have seriously threatened the future of Caspian Sea caviar harvesting. Beluga sturgeon populations have been declining at an alarming rate. Other species of sturgeon and fish have become increasingly popular alternatives to Russian and Iranian caviar. In the early 19th century, the United States was actually the world's leading producer of caviar, mainly due to the abundance of lake sturgeon in the Northeast and West. Roe was so plentiful and inexpensive at one point that saloons served it to create thirsty customers. It was only later when imported supplies from Iran and Russia became limited that caviar became a luxury item. As with many other gourmet foods served at formal functions, there are etiquette rules attached with caviar. 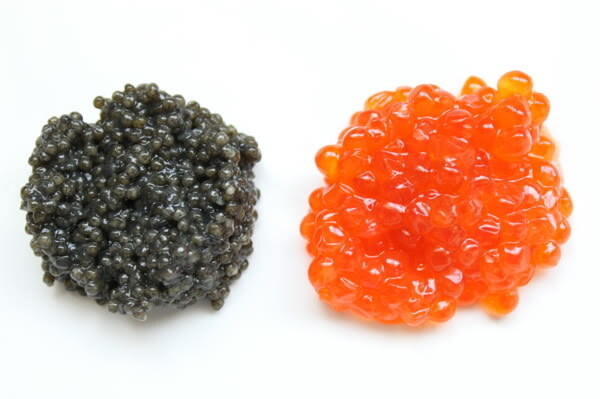 It should never be served with metal utensils - the sensitive "berries" (the proper name for roe) can develop a very off-putting metallic taste. Caviar spoons made from bone, mother of pearl or tortoise shell are sold in specialty shops for just such occasions. When served on a small cracker or canape, it should be eaten in one bite, but caviar served as an appetizer should be mixed with chopped egg whites and yolks and placed on toast points before eating. In the United States, tins of caviar must list the name of the fish first, unless it is definitely sturgeon roe. Other fish used in its production could be paddle fish, salmon or a contemporary of the sturgeon called bowfin or "Choupique." Each variety of fish produces a distinctive flavor of roe, with some even rivaling or surpassing the quality of Russian or Iranian brands. The flavor of caviar is often referred to as an acquired taste, but those who enjoy it say it is an intense explosion of complex flavors. The brining solution contributes a little to the overall palate, but enthusiasts often savor the luxurious texture and indescribably rich taste of the berries themselves. Recipes using Caviar see Here and Here.